This is a guest post we wanted to share with you written by a local blogger who recently tried our fireworks cruise and wrote about the experience. This excursion takes place every Thursday during the summer and a few other times throughout the year when they have fireworks on Destin Harbor. Enjoy and let us know if you have any questions about this excursion or any others! Recently I had the opportunity to go on a Fireworks Cruise with Destin Snorkel. It was a great experience and an amazing up-close view of the fireworks. The Destin Snorkel fireworks cruise departs from the docks of Harborwalk Village every Thursday night from Memorial Day through Labor Day. 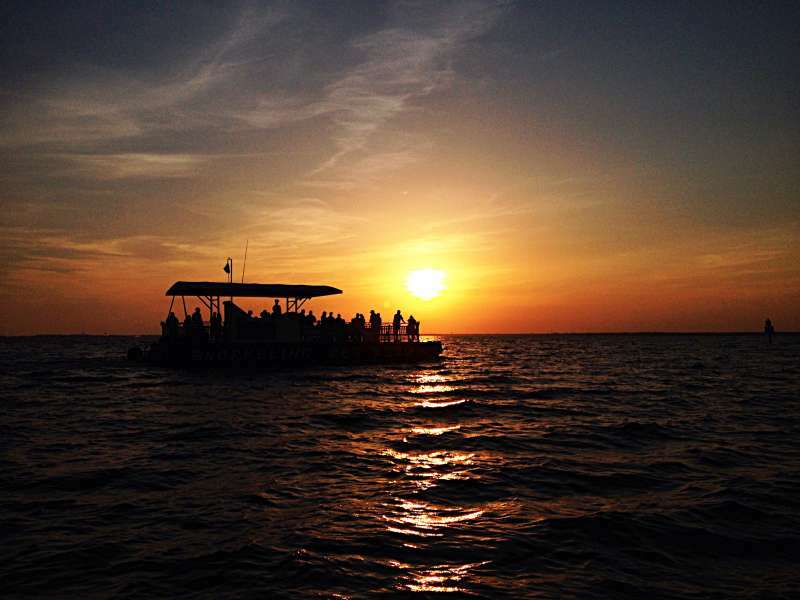 They offer other excursions during the day such as sunset and dolphin tours, snorkeling, snuba, and shelling. I wrote this post to tell you about my experience as well as everything I think you need to know to prepare for and enjoy your fireworks cruise. My tour started by checking in at the Destin Snorkel Hut which is located in a small alley of shops in the heart of Harborwalk Village. The alley is located between Jackacudas restaurant and the main Harborwalk Marina building. If you walk down the stairs from the main parking lot, you will make a right in Harborwalk Village and it will be on your left across from the main events stage. Once I got checked in, they gave me a ticket to hand to the captain and told me where to wait for the boat on the nearby docks close to Harry T’s Restaurant. I waited for a few minutes with the other fireworks cruisers until Captain Andy came to greet us and help us board the boat. Each group had their picture taken by Rachel, his first mate, as they boarded. After the cruise, the photos were available for purchase for at the Destin Snorkel Hut. 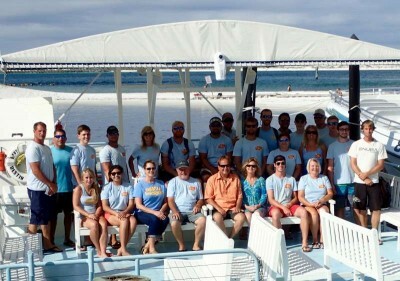 Our group was cruising on the newest boat in the Destin Snorkel fleet– The Kokomo II. It holds 49 passengers with plenty of covered and uncovered seating as well as a bathroom on board. There were 42 passengers on our cruise and it did not feel cramped or uncomfortable to me at all. There was plenty of space to comfortably move around and no one was fighting for the best spot as I was imagining. The boat departed at 8:30pm and went east down the harbor for a brief tour before heading to the fireworks spot. Rachel offered everyone drinks as the boat departed. They have water and soda on board but you are allowed to bring your own alcoholic beverages as long as there is no glass. During the tour, Captain Andy gave us general information about the harbor and about some of the restaurants we passed such as Harbor Docks, Boshamps, and the Boathouse Oyster Bar. At about 8:45 the boat turned around and headed west toward the Destin bridge passing Harborwalk Village on the right. The fireworks are set off from a barge located in the water between Norriego Point and the west jetties beach area. Our boat stopped in that area along with several other boats. We waited about 5 minutes for fireworks to start. The fireworks go off at 9:00pm and last about 5-6 minutes. We had a great view–directly facing them. When the fireworks ended we went back and docked on the harbor. Anyone on a deck crew or taking people out on a water excursion in Destin works for tips so remember to bring some cash. At the end of the cruise, you can thank your captain and first mate by giving them a tip as you exit the boat. Trying to park at Harborwalk Village at this time of the evening (when everyone is going there for dinner and fireworks) will probably take at least 30-60 minutes longer than you think it should. I’m not telling you this to deter you from the excursion, but just want you to plan realistically for it so you don’t miss the boat. The best parking strategy is to arrive earlier in the day. Arriving before 5 or 6pm is the best way to get a parking spot. You can spend the extra time before your cruise watching the charter boats clean their fresh catches from the day, enjoying the sunset on the harbor, doing some shopping or grabbing dinner and drinks at one of the many nearby restaurants. I very much enjoyed the Fireworks cruise and highly recommend it if you are in Destin on a Thursday night this summer. How’s the Summer Weather In Destin? This is a perfect week to tackle this subject! Our summers in Destin, FL are normally sunny, humid and beautiful. This and our clear gulf waters help to make it so fabulous for all of our water activities, but also a perfect recipe for pop up summer storms or showers. There is one thing to keep in mind 40% chance of rain here all summer long. Yep, you read that right, normal for us, 40% chance of rain. Here is what it means for us; somewhere in a 15 mile radius it will probably rain. We will be able to see that storm in the distance, usually across the Choctawhatchee Bay. Our Booth Staff, Captains, Mates and Owners (even old Snorkel Mom) keeps a close eye on the radar. We are all in contact to stay updated on the storms that pop up. Last summer we delayed about 5 or 6 of our Snorkel or Shelling Tours by about 15 to 20 minutes to let a storm pass through. Then the Snorkel boats were off and our guests had a beautiful Snorkel Tour! Though are a few tours we had to cancel, most were easily rescheduled for another day. There are those weeks that the rain hangs around for a few days, however, we are always hopeful they don’t happen very often! So, our best advice is to have a look at your 10 day forecast on your way into town. Then “try” to choose the best day to book your Snuba, Snorkel or Shelling tour. However, the weather here is constantly changing. If we see something on radar we will call and give you a heads up as soon as we know. Or, if you are concerned, you are welcome to give us a call. It may be raining “Cats and Dogs” in Miramar Beach or Ft. Walton, but where we are and go out to, it is sunny. Mother Nature is a fickle gal, so don’t let her make you worry. Destin Snorkel is happy to announce we received another Trip Advisor Certificate of Excellence Award, this will be the 3rd year in a row!!! Customer service is very important to each and every one of our team members at Destin Snorkel. We appreciate our guests giving us an opportunity to make memories during your family vacation. Many of our guests have been with us for years, we thank you for being a large part of making Destin Snorkel the leader in snorkeling, SNUBA, shelling and dolphin/sunset tours in Destin! Thank you from our team at Destin Snorkel! Have a safe and enjoyable Memorial Day weekend. High School graduations are just around the corner for our Niceville, Ft Walton Beach, Destin and South Walton students. If you’re looking for a graduation party to stand out for your guests, charter one of Destin Snorkel’s boats for a private dolphin cruise! Our boats accommodate up to 49 passengers. You’re welcome to decorate the boat and bring on the party snacks. For more information please contact Danette at (850)797-2963. 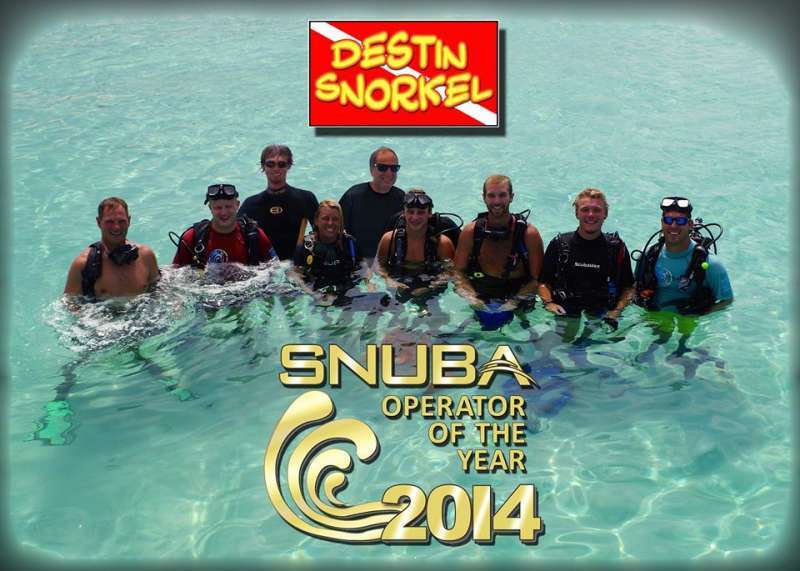 Destin Snorkel couldn’t be more proud of our team as we were awarded SNUBA International’s 2014 Operator of the Year! With SNUBA operator’s all over the world, this award is quite an achievement! Our SNUBA teams commitment to safety, customer service, and overall guest experience shines throughout each and every tour they have. Thank you Capt. Challis, Andy, Ty, Kris, Dwight, Hank, Nick, Caleb, Taylor and all of SNUBA guests for making this happen!